It's springtime, birds are singing, children are playing, the grass is growing . . . so why is it frickin' 27 degrees outside? Good thing table tennis is an indoor sport. After I won hardbat singles at the Cary Cup, I was hobbling about with various injuries in both knees, right leg, right shoulder, and upper back. Now, ten days later, four out of five of these problems have mostly gone away. The remaining nefarious injury that won't go away? My upper back is still a mess. I had to stop early on Friday at the club, where I was a practice partner for our elite junior program. On Saturday and Sunday, I coached and practiced with the juniors, but only with the beginning ones - I could barely move and so couldn't really play high level with the advanced ones. I'm off for a few days, then I coach Thur-Fri-Sat-Sun-Mon, so I better get better quick. Maybe I should lunch on Advil. On the forum today, someone posted questions about the fifth-ball attack, and why players tend to miss the fifth ball when the third ball is against backspin. Specifically, he wrote, "I've noticed that the 5th ball is missed quite often when the 3rd ball attack is against under spin." Third-ball attack means the server serves, the opponent receives, and the server attacks. Fifth-ball attack means the server serves, the opponent receives, the server attacks with the intent of setting up a ball to put away, the receiver returns the attack, usually with a block, and the server attacks again, often trying to end the point. When I give serve lectures at our clinics, I often demonstrate heavy backspin by serving with an extremely open racket - so open that it actually is aiming backwards, and you contact bottom front of the ball - and serve so the ball jumps back into the net. (It's more easily done with a high toss.) Here's a pair of great videos at TableTennisMaster that demo this - first Chinese star Ma Lin (shirtless) demonstrating the serve (1:18), and then a more detailed demo that shows how it is done (2:10). They call them "ghost serves." Tim Boggan and I are leaving for Cary, NC for the Butterfly Cary Cup Table Tennis Championships this morning. It's about six hours away. He's doing the coverage for USA Table Tennis Magazine, and then continuing on to South Carolina, where he'll meet his wife for a vacation through March 28. I'm playing the hardbat event on Friday (roughly 10AM-3PM - I'm the defending champion), and then I'm coaching the rest of the way. I'll mostly be coaching Tong Tong Gong, a member of the USA National Cadet Team and MDTTC, though I may coach some other Marylanders when I'm free. So what does one do just before a tournament? Why, practice serves, of course. Sometime today I'll stop by the club and practice my hardbat serves - yes, hardbat - so they'll be ready. 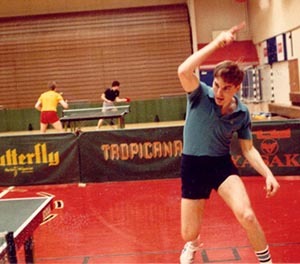 History of U.S. Table Tennis: Vol. 11! Doubles Training at Double Speed! Here's Massimo Costantini (head coach at ICC and former long-time member of the Italian National Team) training Ariel Hsing and Lily Zhang in doubles. It's a pretty impressive video, though only a minute and nine seconds long. If you want to see some really advanced doubles footwork training, take a look. Just watching it will tire you out. I've coached doubles at tournaments many times, and I've given lectures on doubles tactics and footwork. However, I've never had the opportunity to train a really, Really, REALLY high-level doubles team like this, especially on a regular basis. Unless you train for it a lot, this type of footwork is more likely to lead to horrible collisions and agonizing losses than glorious wins. But if you really want to be really good at doubles at a really high level, this is what you really need to learn how to do. Really.